AMD's Ryzen processor launch is right around the corner, expected in late February or early March—right around the time of GDC 2017. I've covered most of what we know and expect from AMD Ryzen, but the latest news/rumor might be a bit surprising. Numerous sites are reporting that AMD will not be launching 6-core Ryzen parts. Instead, at launch there will be 4-core and 8-core products with nothing in between. Going back to the basic building block of the Zen architecture, AMD uses a 4-core module with SMT (simultaneous multi-threading) providing 8-threads similar to Intel's Hyper-Threading, along with a shared (between the four cores at least) 8MB L3 cache. This replaces the Bulldozer family's CMT, aka Clustered Multi-Threading, modules that paired two independent integer cores with a shared FP/SSE/AVX unit. I mention the CMT module because it may have some parallels to what we're hearing about Ryzen. Every Bulldozer family CPU/APU had 1, 2, 3, or 4 fully enabled modules—there were no special variations where one of the integer cores was disabled. There's a certain level of granularity in processor designs that determines the ability to harvest partially functional chips. If a chip is designed so that either the entire CMT module works or it doesn't, which was the case with the Bulldozer family, then that's it. There's a similar parallel in the world of GPUs, where AMD's GCN architecture has used a 64-core building block while Nvidia has used anywhere from 64-core (Pascal GP100) to 128-core (Maxwell and the rest of Pascal) to 196-core (Kepler). Regardless of the GPU, those blocks were the smallest unit that AMD or Nvidia could disable, with later designs like Pascal bringing the ability to partially disable other elements like memory interfaces, ROPs, etc. A high level overview of Ryzen's CPU architecture. The question with the Zen architecture is whether AMD can partially disable CPU cores in one of the modules, or if they're all-or-nothing designs. Intel for its part has used a 2-core building block dating back to the first Core i7 parts, so all core counts are multiples of two. Years later it might seem like a good time to move to 4-core blocks, but there's still a lot of software that fails to scale well beyond four CPU cores, particularly in the consumer market. Nevertheless, AMD appears willing to take a chance and move to 4-core multiples, or so goes the rumor. AMD will supposedly offset its lack of a 6-core offering by including an 8-core chip that lacks SMT. That means where Intel has Core i3 with 2-core/4-thread, Core i5 with 4-core/4-thread, and i7 with 4-core/8-thread, AMD will offer twice the number of cores/threads at each market segment. Assuming the rumored names are correct, that will give us Ryzen SR3 with 4C/8T, SR5 with 8C/8T, and SR7 with 8C/16T. AMD hasn't officially confirmed any of these reports, and by the time I know the real answer I likely won't be able to say anything until the official launch. 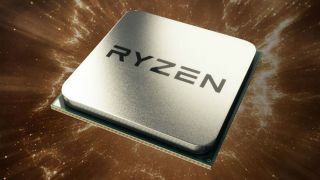 It's a bit surprising, considering AMD's willingness to discuss other aspects of the Zen architecture, but so far the company has maintained a tight seal on final specs (including clock speeds), pricing, and model names for Ryzen. The one thing I'm certain of is that Ryzen will prove far more competitive than AMD's previous CPUs, which is great news as the CPU world has been stagnating. Check back in about a month and we're likely to have the final answer on Ryzen performance and pricing.